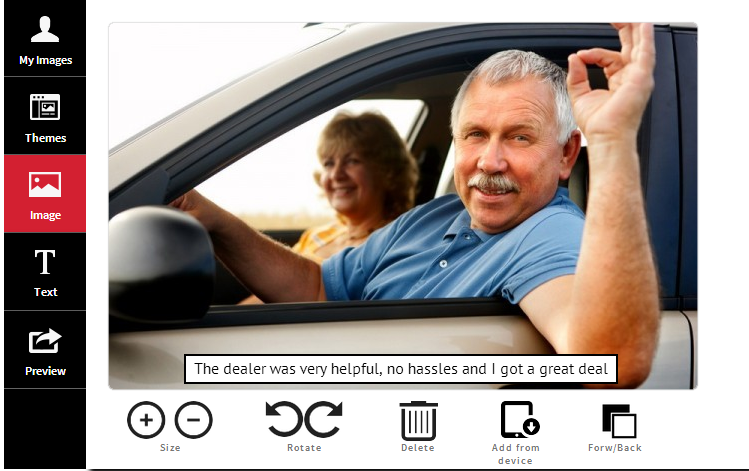 AutoPhoto, is the first photo app of its kind developed by OneBigBroadcast’s innovative technology that augments reputation management, social awareness, search and solidifies your brand through positive feedback from satisfied customers. You no longer need to let these invaluable marketing opportunities slip by. Capture these happy moments as they happen and share them instantly on your customer satisfaction page and across your social channels. The happiest time in the buyers experience is the day they take delivery of their new or preowned vehicle, product or service. We have made it easy to capture that moment with a photo and a text statement from the customer as to why they purchased from your business. There are also many times in Service where a customer is more than satisfied with a repair or the prompt and friendly service they received. These pictures and statements from satisfied customers will do more for your reputation and social awareness than anything that is available to you today and will also help with your search rankings. Customer testimonials also have the highest effectiveness rating for content marketing at 89%. Your employees will also benefit from sharing these treasured moments on their social channels. Start the New Year on a positive and productive note. It may be the best investment you make this year.